Garages are meant to store and protect the family cars, but with time they often turn into a space packed with whatever not, useful or totally useless. Meanwhile, the family may well need some additional space – a family private gym, a hobby studio, a home office, or just an additional guest room. While a full-scale house extension would normally cost a lot, with some creativity and far less expenditures, this can be successfully achieved through converting the concrete garage into an exciting and useful new-purpose space. Any garage transformation project will need a few common preliminary steps, regardless of the purpose of the new space you are about to create. Draw up a renovation project plan with the help of professionals to ensure that your new space complies with the respective local ordinances and building etc. codes and regulations. Raise the floor to allow insulation above the concrete floor slab, as well as for laying plumbing pipes, avoiding water penetration, etc. Fully insulate floor, walls and ceiling for optimal temperature and humidity control. Install heating and cooling system, either by tying it to the house’s main installation, or adding an independent one. Ensure proper electrical wiring and plumbing. Think about creating an easy in-house access to the new room; knocking down a partition wall creating an open floor plan, or just adding a door between the old garage and the house are good ideas to start with. Think about security; include the new space in the all-house security system. Once you’ve finished the preparation work, comes the fun part. 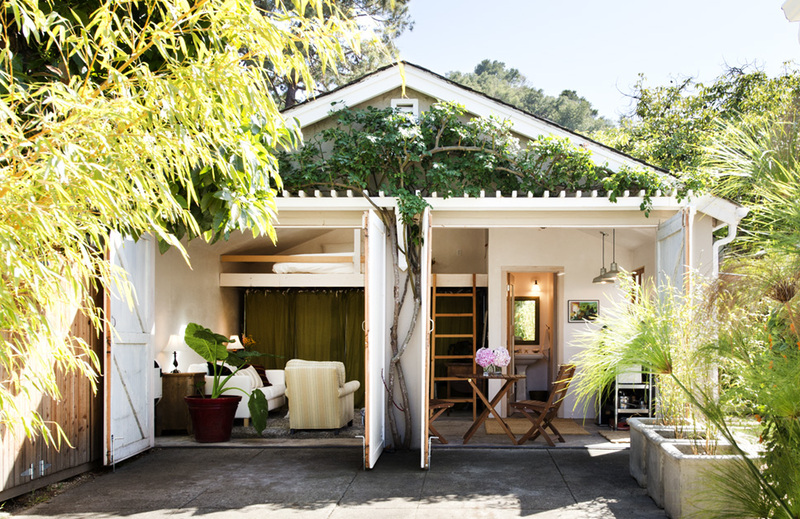 We’ve reached out to the professionals at Lidget for ideas on what an old garage can be turned into. And the list they came up with is impressive! Turning a garage into a guest house is one of the top choices of most families looking for house extension budget-friendly options. Of course, even a very large garage cannot provide an entire guest house, but a guest suite is a very good perspective instead. In this case, interior rules! So, you might seriously consider discussing your plans with an interior designer to get the best layout plan for the new guest suite. Adding a small kitchen and even an en-suite bathroom/toilet is always a good idea. Another useful tip would be to take advantage of the large garage door opening. Replacing the standard garage gate with a tightly weather sealed double house door will, on one hand, make a beautiful new element of the overall look of the house, when closed, while on the other hand, will let more light inside, when open. Besides, such a gate simply demands a nice little porch in front of it. Right? Another option would be to close the opening with a more standard wall-window-door composition. The important thing is to achieve a bright and spacious living space offering enough living comfort and functionality. 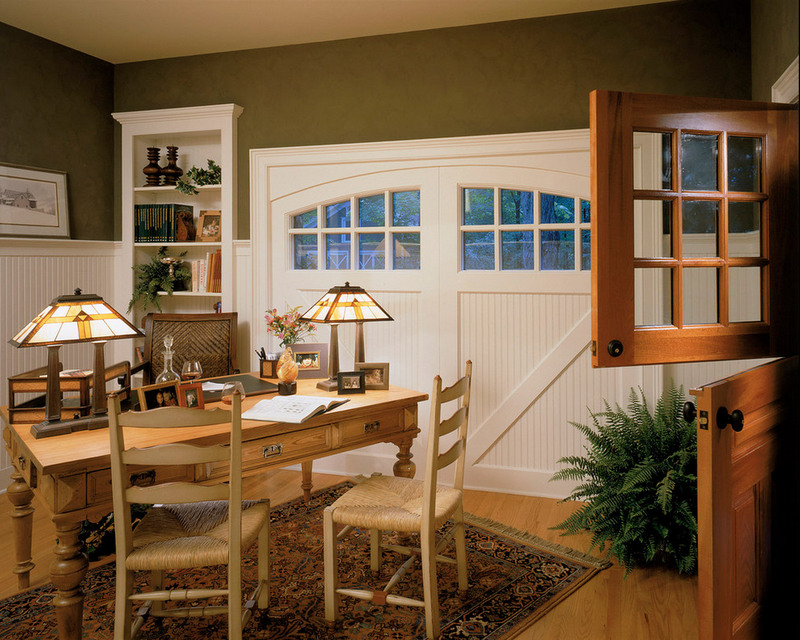 Creating a home office is another top choice when venturing into garage transformation. Home-run businesses have lately become extremely popular (think blogging, online shops, etc. ), not to mention the particular charm of the idea of starting a successful business from your own garage (‘some people’ did!). Creating a home office will pose the same requirements as any other office would – providing convenient work space, lots of storage facilities, and a meeting/conference room option are essential. The most important in this case however is to ensure impeccable electrical and communication systems. Noise insulation is also something to think about when transforming the garage into a home office. Families with more children would be strongly tempted by such an idea! How convenient it would be to have a space where children can play and have fun without disturbing anyone else in the main house! The garage can provide such a space. For this project good floor insulation, room temperature control, and providing plenty of natural light are essential. Think about ensuring proper flooring and thick carpets, as children love playing on the ground. These should be easily cleaned, too. As for the interior, the children will be your best design consultants. The new playroom should be furnished entirely according to their taste and vision. A princess boudoir or a pirate’s cave? It can be done! Just let your children’s imagination guide you. Your task will only be to take care of their safety and comfort. 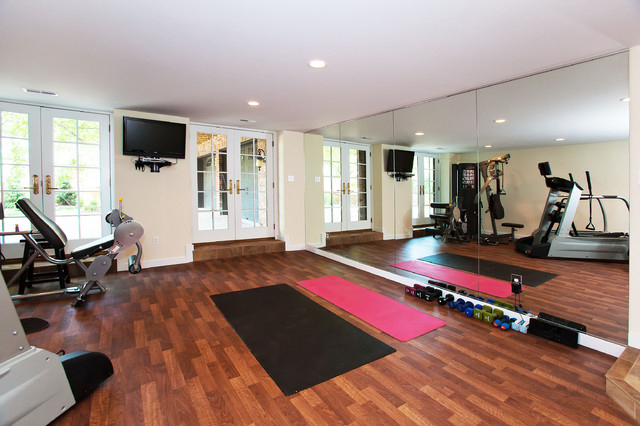 Transforming the garage into a home gym/ fitness room is a great idea! Having your own fitness room is not only convenient, but it saves money and time, too. No schedules, no fees, no crowds of people or occupied equipment, no hygiene concerns, no stress! You can use your gym whenever you wish in the convenience of your own home. Such a garage-transformation project is not so difficult to execute, either. The garage floor will offer enough area to arrange fitness appliances etc. relevant equipment. It is important to install proper flooring able to withstand steady foot traffic and weight overload. It should also be easy to clean, chemicals resistant and with durable coating. The walls and even parts of the ceiling can be used for installing various vertical and hanging storage units, as well as for holding some particular workout appliances. Good ventilation and air conditioning is also very important, so think about it! Absolutely awesome idea, don’t you think?! Having a private Zen-retreat is a dream for many in our busy life. Transforming the cold concrete garage into such a room is a challenging project, but with the help of an interior designer and with some goodwill and creativity, it is possible to accomplish excellent results. The key elements for this project would be ensuring more natural light, pastel soothing color tones, and appropriate air conditioning. Letting more natural light into the new room by adding new windows will allow the presence of more plants which is essential for creating a relaxing ambiance. With appropriate window blinds or curtains light can be controlled to desired levels, too. Pastel tones are always a top choice for relax and meditation premises, so these should not be missed in your new Zen-retreat, either. Finally, air conditioning is crucial for ensuring proper ventilation and air circulation, to create fresh air environment. On the other hand, everyone has his/her own idea of relaxing. For some it may be a Yoga session, while for others it may be just reading a nice book in a quiet space, or enjoying at least half an hour in a hot bathtub in complete tranquility under tender candlelight. These preferences will dictate the interior design solutions of your garage-to-relaxing room transformation project. Book-lovers know how difficult it becomes at times to either find place for all the books or find a quiet reading nook in the house. And while the attic or the basement cannot solve the problem, the garage can. With ensured proper air conditioning and cozy interior, you can have it transformed into a most impressive and comfortable home library to be used by the entire family and even by neighbors and friends. 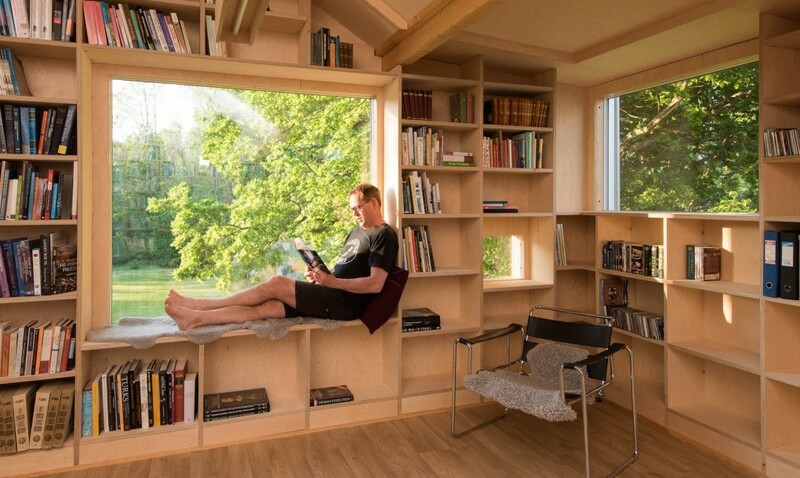 Not only the garage offers excellent conditions for housing lots and lots of convenient bookshelves, but there will be enough space left for accommodating comfortable furniture for spending pleasant time reading a book by yourself or in the company of the your local book-club friends. 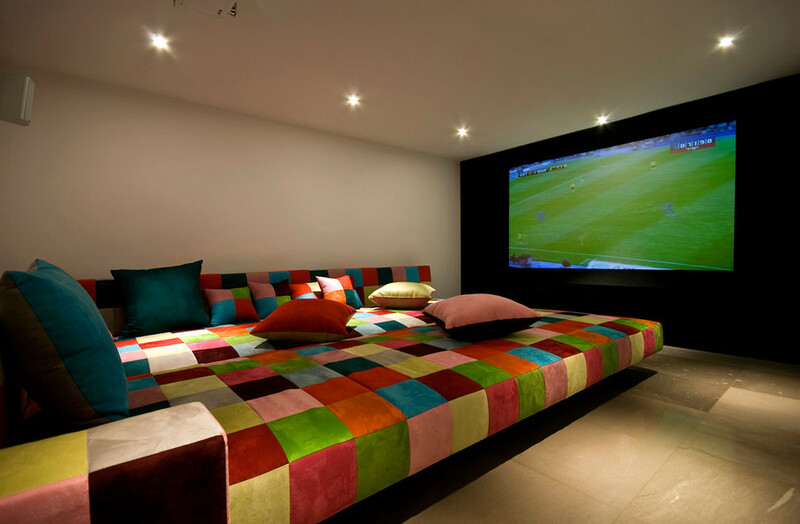 A home movie theater may seem an extravagant luxury, and not an easy project to fulfill. Not cheap either! But it can be an investment that you and your family can enjoy for years to come! Professionally executed planning is crucial, so better consult with a contractor who can provide you with professional advice on what materials to buy and on the overall project execution. Naturally, for such a project the key is in providing excellent soundproof insulation and acoustics, strong electrical wiring system, proper lighting, and according air conditioning. Comfort is also to be seriously considered, regarding the relevant furniture. Finally, the movie theater equipment; it depends of course on your budget, but since you are building something to last, better turn to companies specialized in producing and providing high-quality home theater equipment. There must be something about the name itself that makes such a property so extremely expensive on the real estate market. 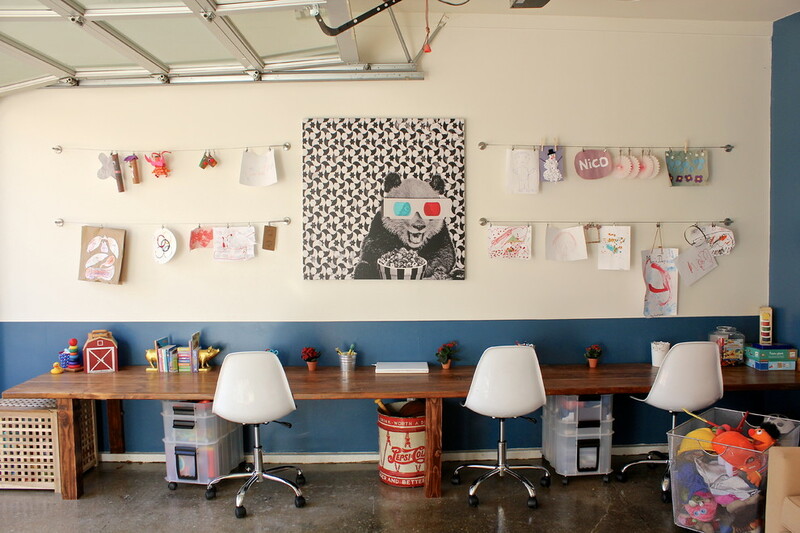 But for far less money, an artist, either professional or an amateur, can have an own art studio in the convenience of his/her own home using the space of the garage. For this project light is crucial. The garage transformation project should therefore focus on ensuring lots of light, both natural and artificial. 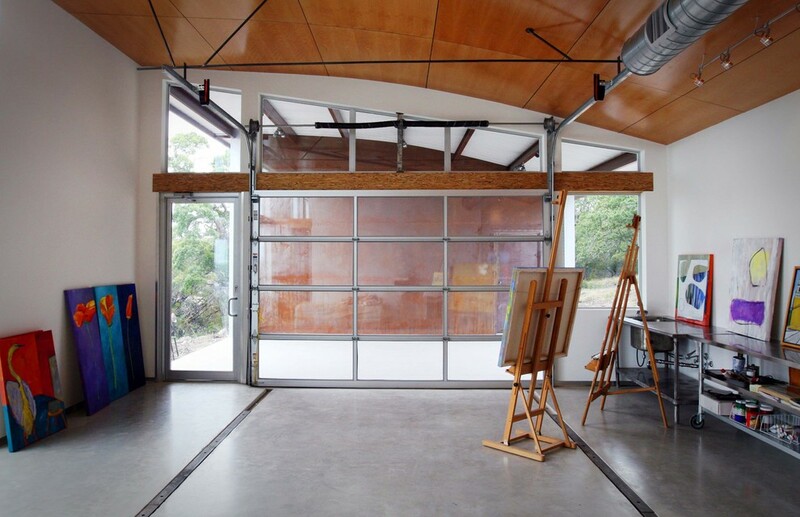 The large garage door opening provides excellent opportunities for this purpose. Where possible, adding additional windows on the walls and on the ceiling would be perfect, too. As for the interior, wooden items would suit most beautifully. Finally, special attention should be paid to ensuring easy-to-clean and maintain flooring as well as good air conditioning for appropriate humidity and temperature control. Finally! Your ambitious rock band can have its own space to play music at will. All it takes is transforming the old garage into a music studio. Now, here we need to perhaps distinguish two main trends the transformation project may have, depending on the final purpose. One, do you need a space to just have fun with friends, or, two, do you need a space for more professional purposes? In the first case, the garage should be transformed so as to provide a room where you and your friends from your amateur music band can rehearse and play music just for pleasure. The same applies for your musically talented kid’s performance, too! The second case is about transforming the garage into a more professional music studio, involving all the above plus recording, mixing, etc. music post-processing activities. Either project should however focus on a few key issues. Solid sound/noise-proof insulation, as well as ensuring excellent acoustics is paramount. In the second case the project will also require some serious work on building according electrical, electronic and communication systems. Finally, serious attention should also be paid to security, since the music studio will house expensive musical equipment and instruments. 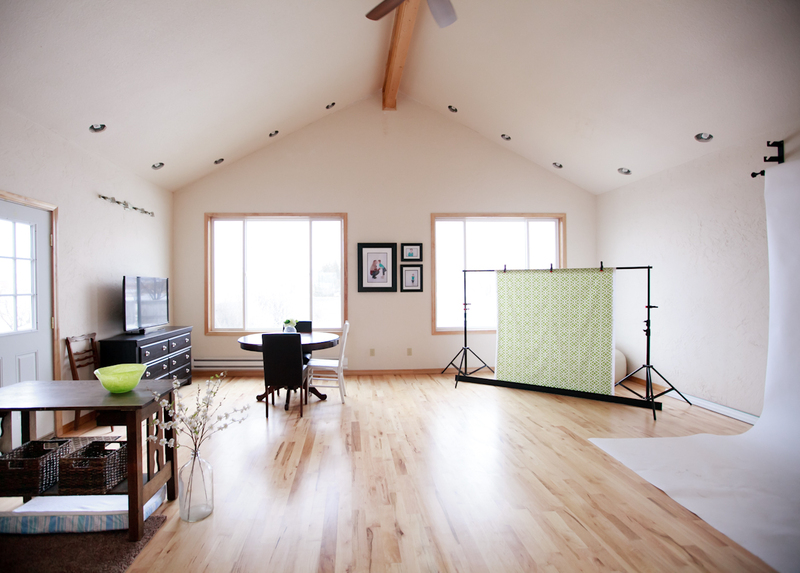 Having your own functional comfortable photo studio is a dream of every photographer, professional or an amateur. A garage provides excellent opportunities of building one without ‘robbing a bank’. For one, the garage offers enough space to arrange all needed equipment for studio photo shoots and photo post-processing. Further on, the large garage opening lets lots of natural light inside and this, as any photographer knows, is essential. Finally, it will be convenient to have your work place just a step away from home and work undisturbed by either the rest of the family or vagaries of weather. It is important to ensure excellent air conditioning and room temperature control, especially for newborn or/and portrait photo shoot sessions. Other than that, the garage will allow enough space to introduce and keep various photo props, flooring and backdrop options, additional lighting sets like light stands, soft boxes, etc., as well as a couple of tables, a desk and storage shelves to place and keep all and any photo accessories. Don’t forget about security! You wouldn’t wish to lose your photo equipment, expensive as it is! It is wonderful to have a hobby! The problem many hobbyists face however is finding a suitable place where they can enjoy their hobby undisturbed. The garage can provide such a space with plenty of conveniences. 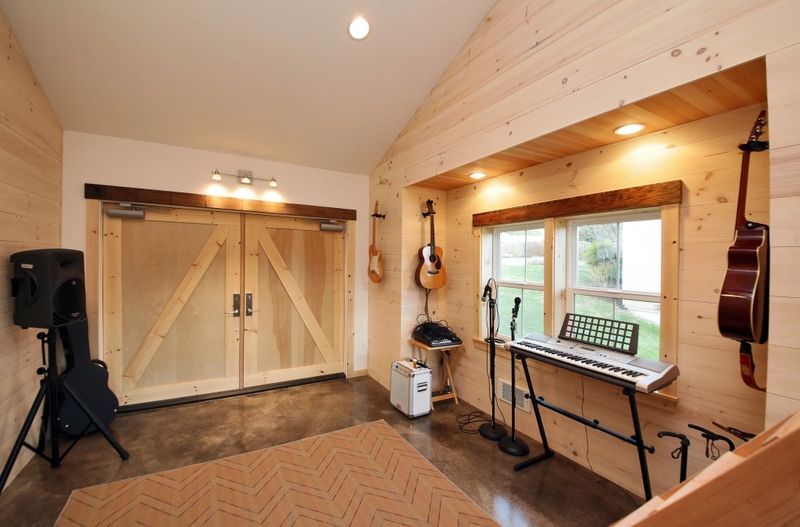 First off, you can design and build your studio as you have always dreamed of having it. Then, you’ll have plenty of storage opportunities, and every hobbyist knows how important it is to have all necessary materials within comfortable reach and access. 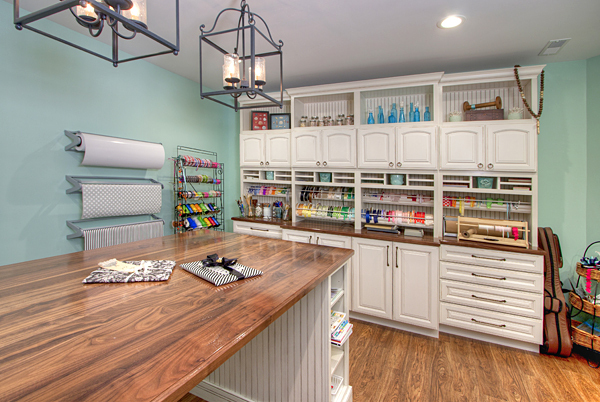 The garage walls can hold dozens of cabinets and shelves for the purpose. There will be place for just every large or small detail and item that you need for your hobby activities. With these nicely arranged, you’ll still have enough space to place on the floor any larger equipment, be it a table or workbench for drawing, cutting, etc. processing, or larger machines like a lathe or a weaving loom. The garage door will allow lots of natural light streaming inside, and this can be further improved by adding a couple of additional windows and according electrical lighting. Depending on your hobby, you can work out a pleasant interior design to let you feel comfortable, cozy and happy. Another excellent idea! Ladies, don’t make that face, now! Boys will be boys forever and will always need their ‘Neverland’. Letting them build it in the old garage will only make them love you even more! Besides, think about all that free time you can spend out with the other girls having fun while men busy themselves with …. well, men’s things! Anyway, transforming a garage into a man’s private retreat is a project very much similar to transforming it into a living space, additional room or a guest suite. It should pursue comfort and security. What makes it a bit different from those, are the particular man’s personal preferences. A man may need the additional space to work on his side-projects, such like building a boat or a Harley Davidson bike from scratch. Or he may need it to gather his friends and have fun playing men’s games like billiards, cards, darts, etc. And let’s never forget how passionate some men can get about playing computer games! The different purposes of the man’s cave will determine the transformation project plan regarding materials involved and interior design items to be introduced. Bars have always been a place to freely socialize with people and have fun. That’s why they have been so popular since forever. Now, to have your own genuine bar right at home…. Wouldn’t this be something?! Your popularity in the neighborhood and among colleagues and friends will simply rocket up! 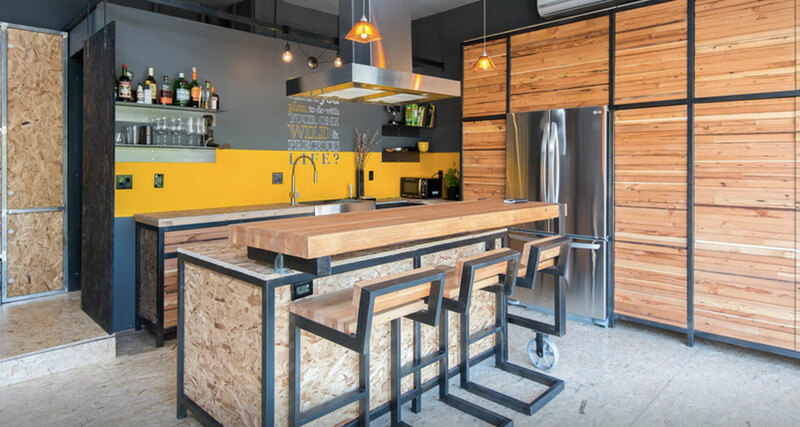 A garage can be successfully transformed into a most pleasant bar/pub place where you can hang out with friends and family and have fun. Special care in this project should be taken regarding flooring and walls and ceiling covering materials. These should be solid and easy to clean and maintain. Wood would be the best solution, but other options are also welcome. Excellent air conditioning and temperature control are also essential, especially for closed-doors seasons and in case smoking is allowed inside. Electrical and plumbing installations should be professionally done! The rest is a matter of design. Naturally, the focal item would be the bar itself. Its place and design would entirely depend on your aesthetic taste and interior preferences, and these will also dictate the choice of all the other items in the room, such as tables, chairs, decorations, dishes, glasses, cups, etc. Add a large flat screen to watch Champions Leagues or Formula 1 race, and spice up things with placing a retro Jukebox. Now … That’s a bar! Cheers! Turning a garage into a home brewery is kind of a bar-project, but with a twist. Because it will be your own drinks that you are going to serve to your guests! And why not turn it all into a fully operational duty-paying and profit-making business?! This project is about managing to fit it all into a limited space and have it successfully function. 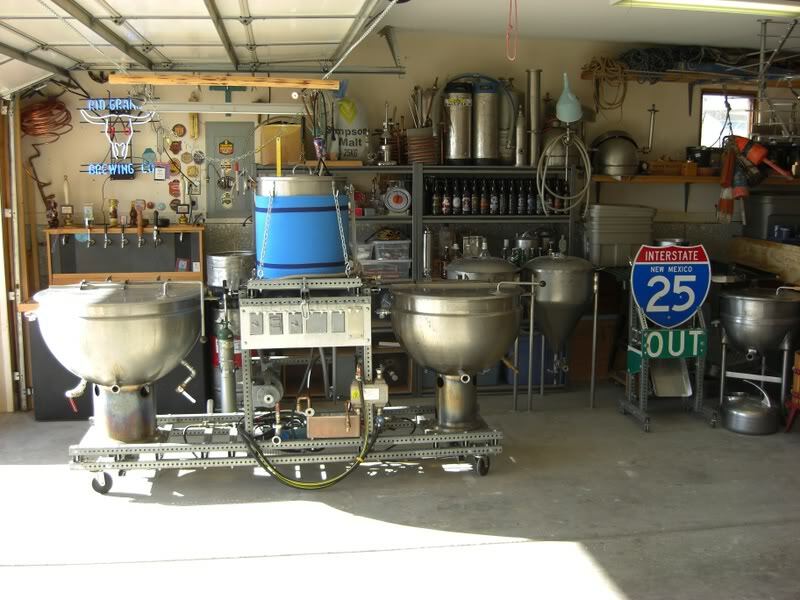 You need to store malt and barley and hops and things… You also need enough space to arrange fermenters etc. brewing system items, barrels, refrigerators… It sounds challenging, but with good planning it can be achieved. Naturally, as in all garage-transformation projects, here, too, excellent insulation, air conditioning, water and drainage piping and gas and electric lines are very important. The floor is of major consideration, too. Even a small garage brewery will need a concrete floor with a certain slope, so that liquid will flow properly to the drains. Brewing equipment should be made of safe, approved materials such as stainless steel or copper. And don’t forget getting the according health standards permits before you offer your guests a glass of your own home-brewed beer! A garage is an ideal place to house a wine cellar. It is just the right size and provides many conveniences for storing your selected wine collection. For this project, excellent insulation and temperature control are paramount. The right humidity and cool air levels must be maintained at all times and contained inside the room, otherwise wine will be spoiled. For these reasons, off and away goes the large garage door, replaced by a smaller and preferably separate entry, tightly weather sealed. A wine cellar cooling unit blowing the warm air outside should be used to maintain the required temperature levels. 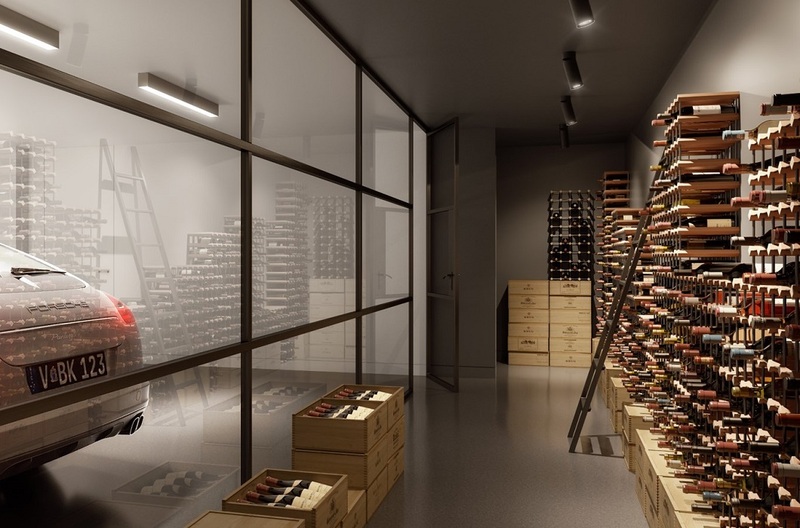 To store wine bottles, you’ll need racks. These can be made of wood or steel, single bottle wine racks, or shelves for bulk storage. And if there’s enough space left, why not add a little bar to provide convenience to the avid sommeliers? !